Step off and hang from the edge of the alcove where you just got bronze #11. 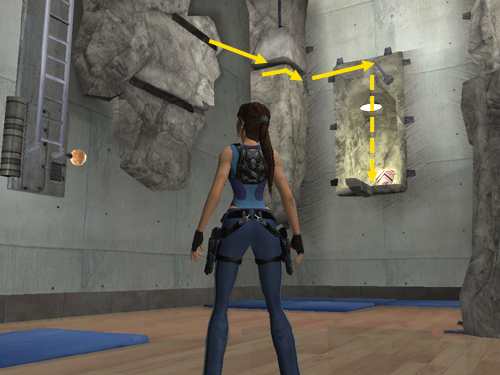 Adjust Lara's left-right position if necessary and then drop to grab the vertical bar below. 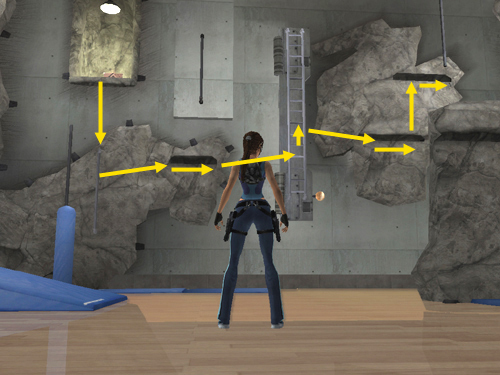 NOTE: If you've already dropped down from the alcove or are returning to the gym to pick up missed rewards, follow the initial steps for bronze #12 to reach the vertical bar mounted on the irregularly shaped rock wall. Then continue following the steps below. Jump to the right to grab the horizontal crevice. Climb to the right and then jump to grab the movable ladder, which should still be flat against the wall. If necessary, climb up the ladder a bit. Then jump from the ladder to grab the lower horizontal crevice in the rock wall to the right. Climb to the right and jump up to grab the higher crevice. Climb to the end of the crevice. Then jump to the right to grab the tall column of rock in the corner of the room. Climb around to the right. Jump back to grab the horizontal pole above the alcove. While hanging from the pole, turn around to face the corner. Then drop and grab the stone beam jutting out from the alcove. Traverse to the right and pull up into the alcove containing the bronze reward (12/16). Grab it and drop to the floor.